The card set is overall in EXCELLENT condition. This is a near complete set of player cards based on the 1987 season stats (issued in 1988). The set includes the original roster sheet and the original rules sheet. I have inventoried and inspected the cards and compared them to the roster sheet. There were 6 cards missing when I acquired the set. I will provide you with scans of the missing cards. Other than the missing cards the set is in great shape. They appear to have been handled very little. I would grade them 7 on a 10 scale (see condition guide below). As a bonus I am also including 50+ cards from 1981-84 which I guess were part of some sort of All Star set and a bunch of 1986 season cards. The 1986 cards only include about 1/2 the teams and of these I'm sure some are incomplete. I don't have a roster for this season so I can't say for sure. Many of these have been placed in plastic sleeves. The other game parts are in VERY GOOD-EXCELLENT condition. The game is 100% complete with all of the game components needed to play. 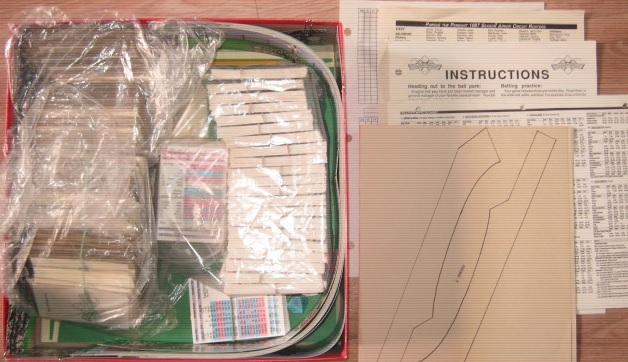 It includes 2 sets of game instructions and other paperwork, 1 for the 1987 version and one for the 1986 version. These show typical handling wear. None of the stadium foul territory overlays have been punched out. Overall I would grade the game parts 6-7 on a 10 scale (see condition guide below). The game box is in VERY GOOD-EXCELLENT condition. Typical shelf wear. I would grade it a 6-7 on a 10 scale (see condition guide below).